AIM CEO Mark Rozario had met Perera in 2011 while the latter was at Isis Enterprise, a wholly-owned subsidiary of Oxford University of the UK. AIM had asked the university to look at the IPs from Malaysian universities. Two years later when Perera visited Malaysia again, this time, delivering another project from Oxford University to SME Corp Malaysia Bhd, he dropped in to say hello to Rozario, who then asked if he was interested in joining AIM. “He said they were struggling with commercialising IPs, and since I had some background in that area and had worked with them in the past, he asked if I would consider coming on board,” Perera says. Perera was put in charge of IBO. And then, he was seconded to SME Corp to help it design a national technology commercialisation platform. “They approached AIM because it was supposed to do commercialisation. Mark decided that I was the best person to go to SME Corp to help it design this. When I started helping them, I realised that it was not too different from what we were doing here [at AIM],” he says. “I have heard enough about duplication [among the various government agencies] and people not talking to each other. I came back and told both Mark and [AIM chief operating officer] Naser [Jaafar] that I felt like we were helping create our own competitor. So, why don’t we just cooperate, instead of creating two entities with the same national agenda. It didn’t make sense. We could help them design a technology commercialisation platform. And I’m heading the IBO here. We’ll put the two together and create something new. PlaTCOM runs two programmes — IBO and High Impact Programme 2 (HIP2) Technology Commercialisation Platform. “I’m not keen on taking on any more because we want to maintain our focus,” says Perera. IBO looks at home-grown innovations that can be transferred to local small and medium enterprises (SMEs). HIP2 looks at providing end-to-end facilitation for SMEs, from concept stage to commercialisation. SMEs need to satisfy a few basic criteria to qualify for HIP2. First, the company must be majority-owned by Malaysians and have a minimum paid-up capital of RM10,000. Second, if it is asking for funding, it will be required to fork out roughly 50% in matching funds (also known as putting some “skin” in the game). Third, although this is not sector-specific, preference will be given to a company operating in one of the National Key Economic Areas. While doing its due diligence, PlaTCOM found that more than funding, SMEs in technology-related areas required hand-holding. “If you have IP that you’ve developed in-house or gained from elsewhere, you have to go through a long tedious process of protecting it. 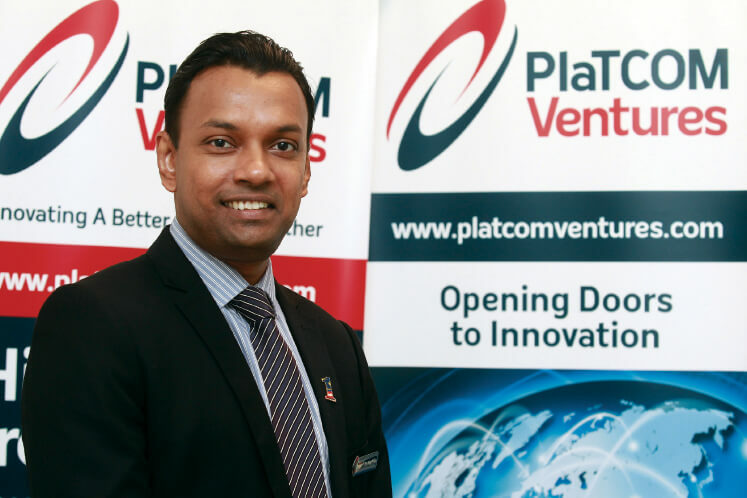 Many of the SMEs we spoke to say they lack awareness of how to protect their IP, don’t know what a patent is or how to go about getting a piece of technology from a university,” says Perera. Before joining Isis Enterprise, he was with Warwick Ventures, the commercialisation arm of Warwick University of the UK, where he had hands-on experience in moving university IPs into industries. And before that, he was involved with a start-up in Australia that would find out what technologies the big pharmaceutical companies were looking at, and then discreetly find out whether it was available at universities, so as not to alert their competitors as to what areas these pharmaceutical companies were moving into. PlaTCOM realises that SMEs need to be taken through the process, at least once or twice, until they learn how the system works. “So, PlaTCOM, through HIP2, created a platform for our SMEs to get end-to-end facilitation to move their innovations to commercial development. Funding is only one of the components. We also provide expertise, access to equipment, infrastructure, incubators, testing and validation services, manufacturing, scale-up, regulatory certification ... there are a lot of things that we can actually help them with,” Perera points out. “And so, we help them strategise — ‘This is your IP strategy, this is your market strategy, this is your go-to-market commercialisation strategy’. And then, we hand-hold them through the process. So, we look at the gaps or barriers that they experience through the development process and help remove them so the company can move forward, whether it is a financial barrier, technology barrier or a lack of expertise in any of the things I mentioned,” says Perera. Under HIP2, PlaTCOM provides support for SMEs until their innovations hit the market. To date, what is its success? “With our first programme, we have transferred 62 IPs from universities and research institutes to industries. And over 90% of them are home-grown,” says Perera. What about the other 10%? “Four of them came from Singapore. One of our companies took them to develop and market them in Malaysia. That’s another way to create wealth. A lot of people have the misconception that if the technologies are brought in from Singapore, they are foreign. Not really, because we are not bringing in market-ready products. We bring in technologies and our companies fully develop them, add value to them and then sell them to create wealth for the nation,” he says. PlatCOM also helps acquire technologies from other countries. “We look at what kind of technology a company needs and then scout around for it. If it is not available in Malaysia, we’ll find out where it is available and what kind of agreements the company will have to sign to acquire it. Then, we look at things like licensing because you need a licence from the originators of the IP to commercially develop it,” says Perera. Since it started the programmes, PlaTCOM has been fairly active. “For our first programme, we have done 62 IPs. Our KPI (key performance indicator) for last year was 10, but we did 26 [IP transfers]. This year, our KPI is 24, but we have already done 36,” says Perera. The IPs are for various industries — medical diagnostics and treatment, information and communications technology, cosmoceuticals, construction and halal-related technologies. With regard to halal-related technologies, PlaTCOM ran a hi-tech challenge this year to find out what is out there in the market. “We were looking at what the gaps and opportunities were in the Malaysian market ... just brainstorming. And we realised that although Malaysia wants to position itself as a global halal hub and the Jakim (Jabatan Kemajuan Islam Malaysia) certification is recognised worldwide, nobody had done anything to help our companies develop technologies for this US$2 trillion to US$3 trillion market,” says Perera. Then the SME can send an inquiry to PlaTCOM via its website. If PlaTCOM finds the innovation interesting, it will invite the entrepreneur to give a presentation. “Then, he has to go through a three-tier exercise, but we do it very fast. The first is carried out by project managers at PlaTCOM, whom we have trained to look at every innovation from three angles — technology, market and IP. So, they do their analyses and then they look into the financial requirements to see how the innovation can fit into our funding and support models. Once they have done that and if they think it is good and the SME qualifies, they will build a business case. “Then, they send an application form, together with the guidelines, to the SME. Even here, we help them fill in the form. We don’t reject an idea just because they send us an incomplete application. I have heard of a government agency rejecting some 2,000 applications out of the 3,000 received — not because the technologies were bad but because the applications were incomplete,” he says, shaking his head in disbelief. Once the application is received, PlaTCOM will help the company build its business case and refine its pitch. “We train them to pitch to the final committee — that’s the second tier. The steering committee for the programme consists of two representatives from SME Corp and two from AIM. So, it’s not our call; it’s the committee’s call. That’s how we keep things unbiased and transparent,” says Perera. In fact, quite a few companies are asking for support rather than money, he adds. “We have had this one company who asked us for RM169,000 for testing and validation because after that, it would be able to change the label of its wound spray from a cosmeceutical to a traditional medicine application, which means that it could then be sold at pharmacies. Perera says such cases show that PlaTCOM’s model is suited to the Malaysian environment. PlaTCOM has a 12-member team. Last year, it received RM8 million in funding for SMEs. This year, the sum was increased fivefold to RM40 million. PlaTCOM is also seeking an allocation under the 11th Malaysia Plan.